Moving your body does not have to feel like exercise !It can be anything you want it to be. You may be surprised that it does not have to be a Gym Membership to lose weight and to stay healthy. In fact many people live a long life in health and good spirits just doing the things they love to do by moving their body every day and they even have fun doing it. In the photo are just of the few ways that I enjoy moving my body , and for others it could be entirely something else. The only thing that really matters is that you make moving your body a life time commitment to your life style, and you enjoy it and even include friends and family to join in whenever possible. Some people like to exercise and weight train inside a gym and that is good also , and others prefer to exercise out side in fresh air or do both. I do both ,but mostly out side to connect with Nature , to oxygenate my lungs, and to get the vitamin sunshine D into my body through my skin. I know a lot of people out there may be thinking well, what about Skin Cancer with all that sun ? Well, the TRUTH is people that eat right with natural high antioxidant raw plant based fresh foods of Fruits ,Vegetables , Sprouts, Herbs, and are hydrated with enough pure clean water every day ,will have protection from with in. My own skin after living more than 15 years in hot tropical Phuket Thailand near the equator does not burn so easily and I really can say never ,even though I do spend long hours in the sun at times.I can remember often that my skin would burn and peal when I was much younger living further north in Canada on a typical SAD diet (Standard American Diet) including cooked meats ,dairy, processed foods ,restaurant ,confectionaries and fast food convenient outlets . Even my younger brother named Dan who is on a high RAW plant based high antioxidant diet himself for over 2 decades now notices the protective change of his skin, never experiencing sun burn and skin pealing ,when he has visited Phuket 6 months of the year for the last 6 years. Is this just a coincidence ? Or is there more to this story? Studies show that almost all skin creams actually reduce or block out the absorption of essential vitamin D which is actually a hormone, and is stored in the liver to help regulate our hormones and research out of Canada is suggesting the Vitamin D has protective factors against all kinds of Cancers.The further north or south you live from the Earths Equator the more sunshine exposure you need for your Vitamin D.
For example if I know that I will be on my mountain bike for several hours on a warm sunny day,I will cover my exposed body parts , with pure Aloe Vera Gel that I grow in my garden.Aloe is easy to grow ,as one plant will replicate itself over time with new stalks and they love the sun and do not need much water. Aloe is proven to be a potent medicinal plant ,and even the Thai Spas ,Massage Parlors and Skin Clinics on Phuket Island use fresh Aloe Vera gel to treat tourists and locals with sunburn damage on their skin. To my thinking ,that is putting the cart before the horse, and is being used as a costly treatment ,and not used as prevention. It is not uncommon ,that I will take Aloe Vera internally , by adding some of the clear gel, to my smoothies,and even to some of my home made medicinal herbal dressings for salads and toppings. I am not kidding about this. In my Gourmet experience ,Aloe Vera Gel can be used in many different recipes that I never seen implemented in other spa type culinary eateries. Of course with any medicinal herb or plant ,it is wise and necessary to rotate the plants in the diet and to take dietary days off before resumption. Our skin is permeable meaning that nutrients good and bad ,are readily absorbed through the membrane pores, and also our internal body toxins are excreted out through the process of sweating .We know today that aloe vera is used in many products such as moisturizers, shampoo ,conditioners ,human and even our pet products. The Skin our largest body organ ,next to our Liver is one of the most in my opinion , neglected and most misunderstood organ on our human body. Include Aloe Vera in your life for better health and wellness. Fare skinned people need less exposure to Vitamin D sunshine and darker skinned people need more of it. If I know that I will be outside in the sun for long extended periods of time I use common sense and prudence to protect my skin . Early morning and late afternoons are good times for moving your body,and I am covered with clothing when I stay out for longer extended times in the sun. Always hydrate your body with water and more water as you increase the time and endurance of your sports,garden and recreational activity. I am walking my Dog named Lucky in Land & House Park green development area near my home. Often I take this opportunity to give commands to my dog ,with awards of praise and the odd treat. My dog walks by my side and is never allowed to pull on the leash in front of me. Often my dog is my interval jogging partner as well . The photo at the bottom right is me working in my garden lifting rocks to make a raised bed of soil. Moving soil and rocks around is a good work out in itself. 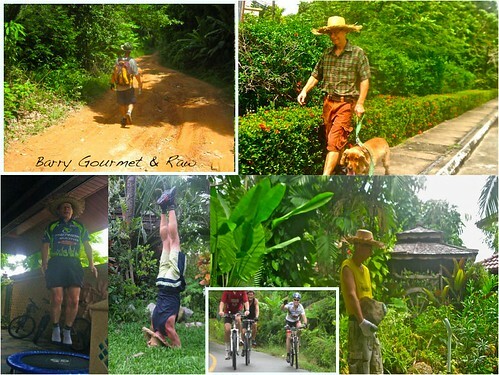 Often I take my mountain bike for a tour around the southern end of Phuket Island. I have more than 10 different and exciting scenic routes to choose from , with different challenges and things to see. Garden Yoga , and stretching outside is great for your connection with Nature. And finally I am having some fun rebounding on my mini trampoline. Every day is different for me and I mix it up and feel good after moving my body. Why Eat a Plant Based Diet for Longevity? These groups of people ,studied by the National Geographic Society ,backed by pure science has proven that people that live on a plant based diet , with a great percentage of Raw Greens included ,lived well and lived long. They some times ate a bit of fish, an egg , maybe a free range duck or hen running around , but mostly vegetables and fruits in that order. They included in their diets sea vegetables (seaweeds) Legumes ,nuts and seeds, as well. Some raw fermented probiotic foods as well and on occasion some natural alcohol beverage. They have no need for Vitamin and Mineral supplements sold on the internet or in retail stores,and they have no need to join up with Gym Memberships either. They move their bodies out side in the fresh air,in the most natural way, by gardening, walking, riding a bike, swimming in the sea, chopping wood, using their own body weight for exercise and so forth. They are close to their community and family and have purpose in their life with their faith. It really cannot get any more simple than this. So what happened to our modern day society that has people over weight by 2 to 3 and in many cases one-third of the population is clinically obese? How can we move away from simple carbohydrates ,conventional dairy and much less meat consumption,and commercially processed foods of every kind? How can we move towards Whole Food Plant Based Dieting ?How can we start moving our bodies every day for the rest of our lives? How can we become more active socially in our community and to slow down and to find more purpose in our lives? If we can do all of the above ,then things will change around for us and we can become more happier and healthy. Why we Must Move Our Body? Scheduling time in your daily life to move your body is so important especially today in our modern world because ,we live in a society of convenience and everything is done for us. Genetically, Historically,and Biologically,our body was not built to live this way . In fact the industrial revolution with all the good things that cam out of it , also made everything else easier for us and has replaced intensive physical labor with a more practical, and commercial means of doing business which is good for business but in some cases not good for our bodies. When we stop moving our body for long periods of time like long continuous hours at a computer,or living the life of a couch potato absorbed with TV and comfort food things start to happen over time. Things start to happen with long hours sitting on an overseas trip by Airplane, with long road trips by ,Bus,Train,Truck,Car ,or Van. A large internal section of your body inside,called the Lymphatic System starts to shut down. When this happens, it causes circulatory stress ,with symptoms of discomfort, and your whole immune system becomes compromised,plus your metabolism slows down and becomes sluggish and constipated. Unlike your Heart that Beats continuously 24/7 ,your Lymph can only function properly when you move your body on a regular basis with as much time that you can schedule in to your busy life. Our Lymph nodes are like a mass of meridians spread through out our body and their function is to remove waste and dead over used cells out of our body to protect and help us to survive against the toxins that enter our body every day around the clock. When we eat, a Nature made Breakfast like the one in one of my other photos, puts less toxins into our body to help our Liver and Lymph to function better with exercise or just by moving your body. Think about what happens to people that are bed ridden in hospitals and nursing homes? Their Lymph System shuts down from lack of movement, and then one thing leads to another without any outside fresh air and Vitamin D sunshine topped with denatured cooked meals, lacking in life giving Enzymes can all add up and if continued can present problems later on. Try to hold any kind of pose ,and see how long you can last,how long can you sustain that pose? We are designed to Move are body constantly. Even in our sleep our body randomly moves through out the night more or less. Even writing this article on my iMac at any extended period of time will demand my attention to stop work and to get up and move around for a while until I am ready to work again.After this rest and light movement of my body I can continue with my work at the computer knowing that I have my lymph moving again. It is important to listen to your body signals and symptoms and to make corrections for your health.Eating right like the Breakfast with Barry Gourmet & Raw photo above without moving your body will only over time make your body less efficient in metabolism. Your nutrients from food with more calories coming in and less calories being burned off could promote weight gain. Ways that Barry Gourmet & Raw Moves his body? First and foremost the important thing is not to be concerned too much about what other people are doing , and how much money you intend to spend at a Gym or Sports Equipment.The important thing is to make a mindful commitment and actually implement your body movement plan that makes you the most happiest . Yes, that is right, just do what you like to do and that can be anything. Examples could be Gardening,Dancing,Walking, Jogging, Stretching,Hiking in Nature,Playing on the Monkey Bars in the park,Riding a Bike, Swimming, walking your dog, using your car less,Yoga,using the stairs instead of the Elevator ,and any other way that you find enjoyable for moving your body? For my self the following is the way I get the most enjoyable experience for moving my body. Cardio Interval Training with my Mountain Bike and my land leg exercises. Our body was not designed to do a long extended time of isolated repetitive training. This is why many athletes work on all their body parts to create endurance and strength for the whole body and not just one part of their body. Like a good diet it is good to mix it up , variation , and restful sleep will build and support you for vibrant good health. For my Mountain bike I look for Flats, Hills,and Grades,about seven different long and short tours all together, that offer variable challenges with easy riding as well .And example of Interval Mountain Biking would be the more difficult climb challenging the hill,and at the top, I would be winding or cooling down, and as I am coasting down the other side of the hill my body is in a well deserved rest and the whole process would repeat over again.This is moving your body the Interval Way.A lot of calories can be burned this way,plus you have a chance to enjoy the ,scenic natural beauty ,and is a good all around fantastic Weight Loss and conditioning program. My land leg Interval Exercises are simple. I just walk,then Jog,then make a short Sprint, then reverse to a Jog and then into a walk and then repeat the procedure all over again.If you are just getting started you can first leave out the sprint part and work up to it .Set your own pace. You should try it some time as it really is a potent card work out for you ,but pace your self and work up to it. This is an all around Cardio Interval Body work out for your Heart Health.A lot of calories are burned off this way and it is a Fantastic Weight Loss protocol. Yoga: Originating from India this incredible art of Mind and Body Movement is very beneficial to you in so many ways. Any person young or old can practice this wonderful ancient Art of Breathing,Meditation,Body Stretching,Balance,Resistance,and Flexibility. I personally practice Yoga often every day or every second day with one day of rest per week. I cannot say enough about what Yoga can do for your Peace of Mind and Centered Body. Yoga classes can be very affordable with good value and instruction on the resort island of Phuket Thailand. For example the class that I attend is good for a whole month twice a day at 1and a half hours per class morning and evening. My 2 professional Yoga instructors have over 2 decades of experience teaching Yoga between them and the price will definitely surprise you.I found a QualityYoga Class that is less than 0 USD per month per person, no kidding . This Yoga Experience is a best kept secret in Phuket Islands Yoga Community. Gardening: Yes I enjoy my tropical permaculture garden of exotic edibles and ornamentals. I do not use a sprinkler system , I do everything the old fashioned way with pails of water and lifting rocks and boulders to make my raised garden beds. Turning the soil over , and even turning my compost tumbler bin for a few rotations every day will give me a little exercise as well. This to me is one of the best ways to connect with Nature. At least half of my Breakfast with Barry Gourmet & Raw came from my garden.Many gardeners find it very empowering to be able to add their own garden greens and vegetables ,fruits and herbs to their meals. My Outings with Lucky: Every person and family that has a Dog must find the time to walk their furry friend every day morning or evening . It is so important to your pet big or small. Either wise the dog will crap all over your property because they just do not have the same options as you and I do. Our dog needs the exercise as much as we do so include your dog in you’re moving your body training program every day and this is also a great way to get your best friend to bond with you more than ever. And what does this have to do with my Barry Gourmet moves his body photo you might think? Well, it has a lot of relevancy because it is not unusual that I share a little bit of my breakfast with Lucky my Dog . Yes, my High Enzyme whole plant based diet is also good for your dog as well.Just mix in the Fruits and Vegetables with the help of a blender and stir in some human grade meat proteins but I will get into this more in a future article. Snorkeling with Lucky: Phuket Island has world class beaches , of more than 22 of them all offering something different for the water sports enthusiast. Five of them are just minutes driving from my home and are excellent for coral reef snorkeling with my Dog named Lucky, a 6 year old half Cocker Spaniel and Thai Dog breed. The ocean is like a glass plate of aqua marine in color and with good viability for 6 months of the year September through February. You can order a colorful plate of mixed fruits similar to my recipe photo above at some of these beach restaurants. This is really a fun and healthy way for me to move my body . Lucky wheres a life jacket that has a rope attached to it and I where my protective garden gloves dawned in snorkel gear. I know that Lucky is a very strong sporting gun dog with lots of endurance,and he will chase after anything that moves.So I position my self near the rocky shore line where all the craps live. Then the action starts when my dog starts pulling me through the water ,chasing after all those thousands of never can catch me craps, and my body becomes a human projectile missile beneath the surface ,as I hold on to the leash swimming between and over the corals and swimthroughs. Ocean water is good natural therapy for the body as the chemistry of sea water is very close in chemical composition to human blood. Working out with Lucky?Often on a nice sunny day I will walk Lucky to the park where the Monkey Bars are located. I tether Lucky to a near by tree so that he cannot slobber all over me as I do my reps of resistance moves ,like push ups, chin ups, squats, and stretching in nature. Exercising your Cells and your Lymph: Any person can do this, and it is very enjoyable and relaxing, not to mention lots of fun as well. Dry brushing your skin before a shower every day has many benefits for your skin, your immune system and your lymphatic system… A dry brush is made of natural fibers that can be bought in Health and Spa outlets. You can use a DHC Facial Brush and a regular body brush with a long wooden handle so that you can reach around to your back side. Your skin being the largest detoxing organ on your body needs to have regular maintenance for breathing , and regeneration.Its best to be in your birthday suite in the privacy of your bathroom before starting .Start from the souls of your feet and with short massaging strokes working the brush up your body towards your heart. Your lymph drainage works towards this pathway and the brushing will help with the drainage. Work from your fingers ,hands and arms on both sides toward your heart. A lot of your dead dry skin will be brushed off to allow the newer skin cells to replace the old ones and to tone the body. Start from the top of your head and dry brush down across your face and over your neck that contains a lot of lymph nodes towards your heart again. It is simple to do with practice and it is invigorating. You can expect noticeable results with in 5 months or longer with regular dry brushing. Traditional Thai Massage:Phuket Island has many popular Spas and Wellness Retreats offering affordable Thai Massage. I have a Lymph Cleansing Thai massage at the club house where I live in Land and House Park for one hour once or twice a week. It only costs 300 Thai Baht or .00 USD that includes a foot bath, nice relaxing music, an expert masseuse working on your feet and a Certified trained ND Holistic Doctor working on the body part that ails you the most using hands on acupressure techniques, Chinese Thai Herbs ,topped with herbal tea. Dry Sauna Spa: When your body temperature is slowly raised and maintained for about 15 minutes at this temperature ,your elimination organs including your skin ,start expelling water and stored toxins out of your body through sweating. Your skin pores will be open at this time so when you leave the sauna go straight to your shower room to blast a stream of jet Cold Water to wash off your sweat and to close your skin pores. (Hydrotherapy first brings the red blood cells to the surface using heat then with the cold water the oxygenated red blood cells are returned to your organs as your skin pores are closed. Again our luxury club house Sauna is very affordable at only 100 Thai Baht or .25 USD and you can use the facility more than one time in the same day at this price. Important Note about Sauna:You are Dehydrating your body in the Sauna so it is vitally important to bring a large class jar of liquid to replace the water you are losing. I like to take in a large mason jar filled with my different home made teas or juices to replace the water and electrolytes that I am losing. Rebounding: You can buy any small trampoline or Rebounder at any sports store on Phuket Island for about 0 USD. I like to place my rebounder in the garden with sunshine and fresh air and start slowly bouncing my body up and down , then work up to a stronger tempo. Every cell in your body is getting a good work out and you just feel good after a session. Well, that rounds out my Moving your Body protocol, and I am sure you can be creative in moving your own body in fun and natural ways that I may not have thought of yet? We know that for some people just starting out , from living a sedentary life style of not moving their body for a long extended periods of time like many years it can be difficult. And on top of that they may be overweight or even Obese that compounds the problem of even wanting to move their body. Many years ago I used to be one of those people. How did I break out of these two lifestyle obstacles? And what advice can I offer to you if you are in this same situation? First I need to make clear that no two people will be starting out at the same level of fitness, and the integrity of each persons health will be different. Plus every person will have their own particular reason ,or cause and affect ,and maybe even a traumatic life experience for making a positive change that almost forces the person to make a final decision to move their body. For me many years ago, that decision was made out of fear of living in continued symptomatic pain related to my obesity and living a much shortened lifespan. My obese younger sister for example was give an ultimatum from her Doctor. "From looking at your blood tests, and physical evaluation you cannot expect to live much longer " and she was already on many weight related pharmaceutical drugs already. My sister experienced the same life and death situation that I had, but on a different level of course ,and for many people unfortunately it takes this kind of wake up call to finally break out of the complacency mode that they are in ,and to finally take action to move that body. And to make it your new life style change, to be part of your daily schedule for better good health for the rest of your life. I am happy to say that my sister is now moving her body for 5 months now and I need to say that as each month goes by it just gets easier for her to achieve success , and I will explain how this works. Hopefully you did not let your body go like I did or my sister did,and if that is the case then that is great . For you it may be less medical and more personal ,but I have to say even for people overweight it can be very personal as well. Normally a leaner person will be burning more calories more efficiently with a stronger metabolism ,than a person over weight can do.So a structured transition from you’re existing diet over to a Whole Food Plant Based Diet that includes some Raw Foods will be essential to kick start your metabolism.Raw Green leafy vegetables of all kinds every day is included in my life. I eat every kind of edible vegetable and fruit at home mostly to have control over my nutrition and not give my power away, to some other person or company. After a while you may feel how self empowering it can really be for you. Further more I do eat ground,whole,and sprouted nuts and seeds of every kind. I include all kinds of locally grown fresh herbs and spices that are Natures Secrets to firing up your metabolism for effective weight loss. Avocado and small amounts of wild fish from the sea is included. I eat every kind of bean legume and lentil , and mostly non gluten sprouted or steamed grains on occasion. I include Sea Weeds,Mushrooms dry and fresh Cultured fermented vegetables, broth, and herbal teas. All my cold pressed oils of coconut, and olive are not used for cooking, they are used last for nutritional support and flavoring. I use pure water, or a vegetable stock for my recipes only. I eat a lot of melons as a snack by them selves . I eat small portions of dairy Kefir or Yogurt ,a free range duck or hen egg, a free range hen or duck meat on occasion only. I only consider organic whole food vitamin and mineral supplements ,such as Chlorella ,Spirulina,Bee pollen,Wheat Grass. I will drink and enjoy organic red wine with my meal on occasion. I eat when I am hungry only, and not just for the sake of eating. I due on occasion include real whole dark chocolate in my desert recipes that I am pleased to share with you. Also I am a big fan of fresh Coconut used often in my recipes. I Juice make smoothies,make home made fruit ice creams ,and invent all kinds of ways to present rainbow meals of Earths color for my culinary pleasures and good taste. Hydrate your body with high water content perishable whole foods of variety is your secret weapon to effective weight loss and continued good health. Diet alone will not work, so fitting a fun way to move your body into your busy schedule will give you the one two punch that is needed to succeed in your plan to lose that weight and to stay healthy. Back then I went it alone and I do not recommend it to any person unless your determination and will is really that strong? I would first find a person in your family , or social group of friends that you know has lost weight through diet and exercise,or some person that is already fit and healthy. I would suggest to include this person into your life as someone that could mentor you and help you to stay the course. When you start to include health minded people around you , it starts to get much easier for you than going it alone.Always stay up beat and never let the set backs of temporary weight gain stop you from achieving your goals. Do what works for you, and please connect with Nature for your personal diet decisions,and fun sporting activities that make you feel good in the end. Although there are farms, restaurants and grocery stores all over Chester County, people here are going hungry — one in eight people, according to Bob McNeil, chairman of the Chester County Food Bank. Matthew Corrin believes Freshii, the healthy fast food chain he founded will be a billion dollar enterprise in five years. Does he really have a new approach, or is it all just new packaging? FAST-FOOD chains including McDonald’s, KFC and Pizza Hut will be forced to display kilojoule counts on menus in an attempt to reverse the obesity epidemic. Click here to download a Don’s Home Furnishings coupon! More>> Find and post community events in your surrounding area by visiting our community calendar. Theresa Rebeck’s “The Understudy,” a serious comedy about the joys and agonies of a life in the theater, has the first two nominations of the Acclaim Awards’ 2010-11 season. It continues at Playhouse in the Park through Oct. 17.